In 1975, John Bu'Lock identified what he thought was possible cairn on Mellor Moor above Cobden Edge, which is the highest point in Stockport, the trig point on Mellor Moor being at 328 meters or 1076 feet. It was once a plantation and is now a wildlife preserve above the pastures of a working dairy farm. For the next several years, Ruth Collier, Kath Lowe and John Clarke excavated the site with help from students of Marple Hall School. They uncovered parts of a funerary cairn built around 4000 years ago, with more than a dozen cremation burials, some within stone cists, which were given names like Willie, Pericles, Cecil and Hector. The finds included around 500 flints, many dating from the Early Mesolithic Period around 10,000 years ago. Those associated with burials were consistent with the building of the cairn in the Late Neolithic or Early Bronze Age. 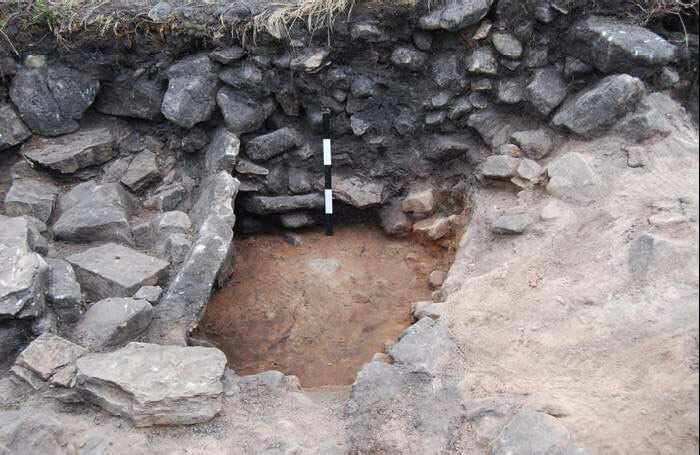 The archive of this excavation came to the Greater Manchester Archaeology Unit and as part of the Mellor Heritage Project, the Trust set itself the task of recording the nature of the cairn more thoroughly and establishing the extent of the earlier excavations, examining the cairn's immediate unexcavated and attempting to understand the setting and nature of the prehistoric activity. Thankfully, though the site had never been backfilled, little intervening damage had been done and the team were able to clean and recored the area more thoroughly and to revisit some areas which had not been thoroughly excvated and destroyed. 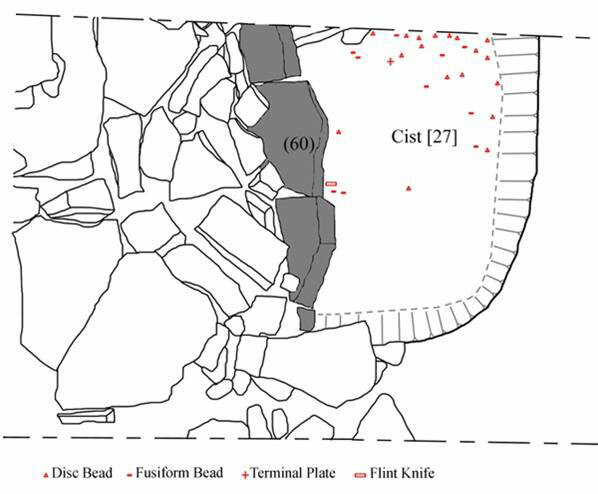 In one of these areas, which proved to be a stone lined cist burial, were amber beads of an incredibly rare amber necklace almost 4,000 years old. Vicky had been working in the same previously disturbed spot for over a week and was not particularly expecting to find anything when she carried out the final clean up. 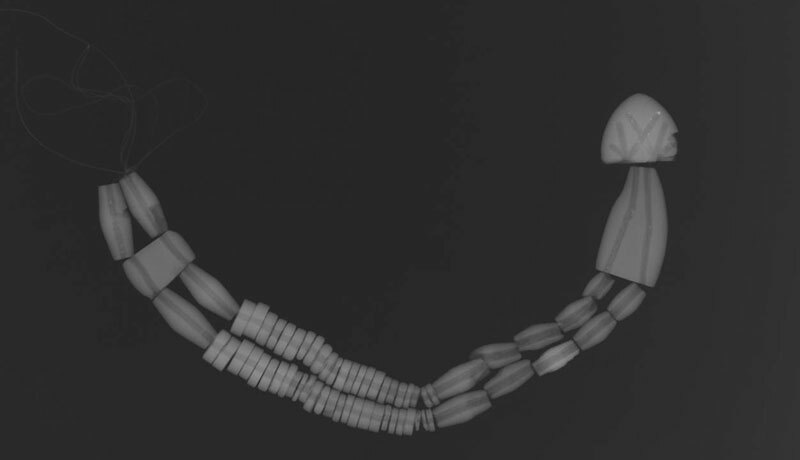 She found what she thought was a seed, but closer inspection revealed a hole at either end and as similar objects began to appear she realised what she had found - an incomplete necklace consists of approximately eighty beads of varying sizes, including between 14 and 16 fusiform beads, c 60 disc beads, 1 spacer plate, 1 terminal plate, 1 V-perforated fastener and fragments of at least another further 10 beads. It has become one of most important discoveries from the Bronze Age to have been found in the North west of England in recent years. The beads were extremely fragile and needed meticulous attention to consolidate and conserve them by Dr Sonia O'Connor of the University of Bradford. 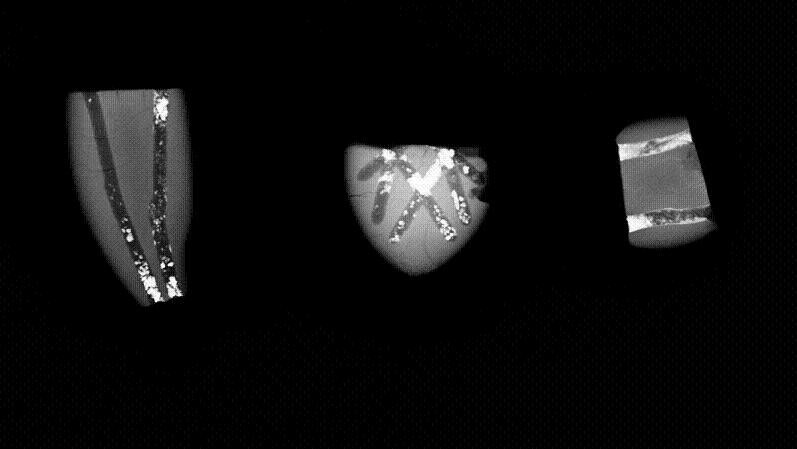 X ray and microscopic examination was used to determine which beads showed wear and which of the drilled holes lined up with others. 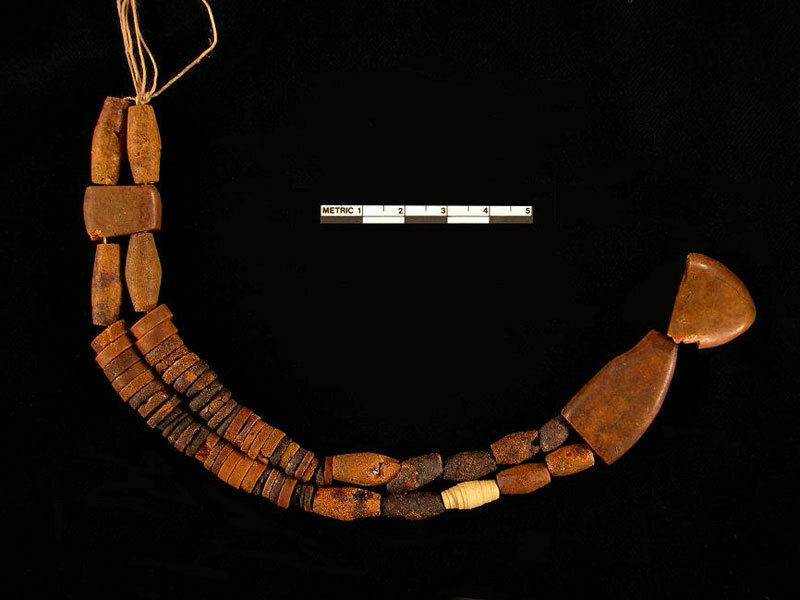 The design of similar necklaces was studied and eventually this information was used to enable them to be re-strung to form a necklace, consistent with the functions of the various beads. We now beleive them to date from Early Bronze Age and therefore to be around four thousand years old. This is thought to represent one of the ultimate status symbols of the Early Bronze Age partly due to their extreme rarity. 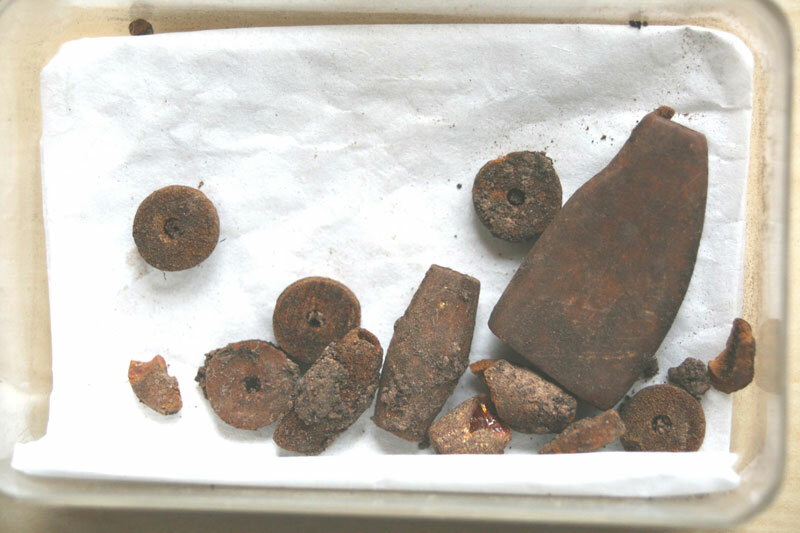 Individual amber beads have been found on burial sites from around the country but the finding of a substantially complete one at Mellor is extraordinary. Prior to this, amber necklaces have only been discovered in Britain within the internationally significant Bronze Age landscapes of Wessex and Orkney and associated with the very highest social status. 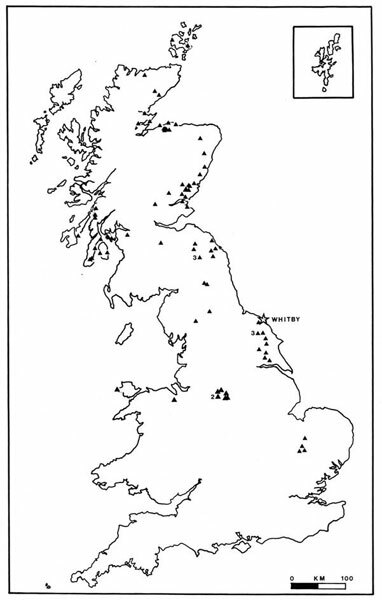 Furthermore, it was believed that all amber necklaces in Britain derived from the Wessex area and that their production and exchange was controlled to some extent by the elite of this area. Infrared Spectroscopy at the University of Manchester establishedtaht the amber used is succinite. 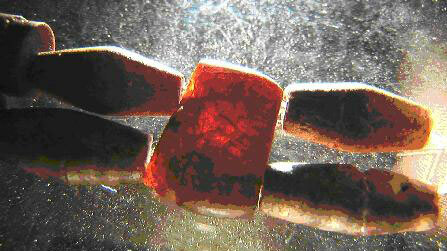 This is a Baltic Amber, which is a generic term used to distinguish it from amber in Italy, Spain or South America. It was formed from the resin of trees growing in Northern Scandinavia, the during the Ice Ages, glaciers carried it South to the Baltic, where there are large deposits and from where it might have been traded, but it was also carried naturally sometimes to the East coast of England. Dr Alison Sheridan of the National Museums of Scotalnd studied the beads and her report tells us that aAlthough extremely rare, amber spacer necklaces have been discovered previously from as far away as the shaft graves at Mycenae, Greece, but previously in Britain all were thought to have been derived from the Wessex area of England. Intriguingly, the Mellor necklace does not appear to copy the Wessex designs and bears more resemblance to the jet spacer necklaces which are found mostly in Northern Britain. 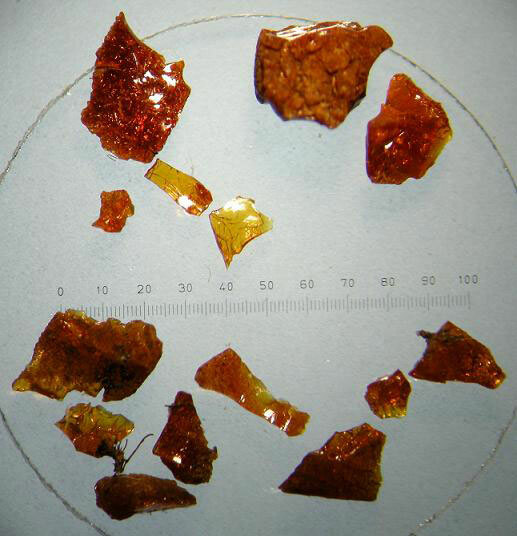 The tradition in the North of Britain and Scotland was for necklaces made from jet rather than amber, which though high status were not thought to have been as socially significant. One of the most important aspects of the Mellor necklace is that it shares its design and shape with the northern jet necklace tradition rather than with the Wessex amber one, possibly suggesting that it was produced for and possibly by northern elites rather than those within Wessex. 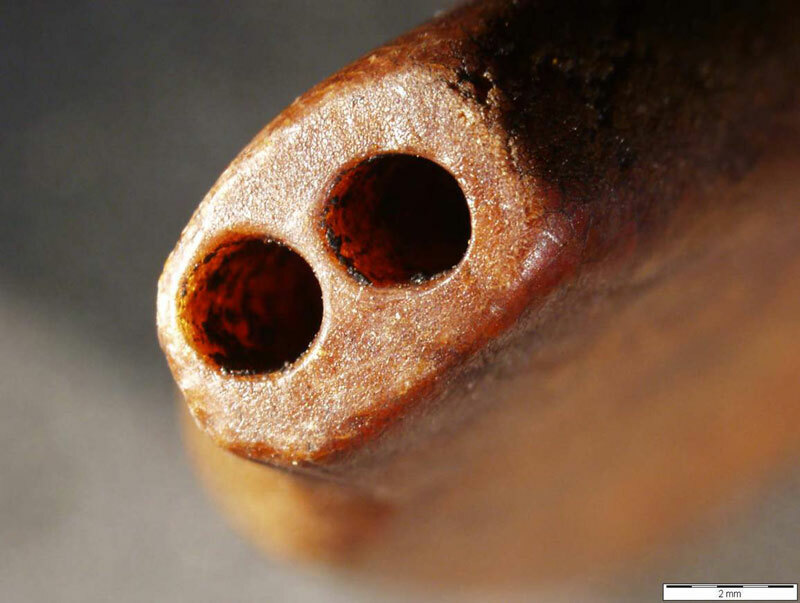 This would indicate that the control and production of these artefacts might not have been limited to Wessex alone and that equally socially significant elites existed outside of this area with the potential to produce and exchange both jet and amber necklaces. Very few examples of this standard of precision have been found from continental Europe. The Prehistoric Pottery from the Cairn gives us a reasonable indication of the date that the necklace was interred. Nothing was demonstrably later than the Early Bronze Age and the fact that there are so many Food Vessels supports the view that the cairn may only have been used for a few generations, perhaps between around 4,100 and 3,800 years ago. It may be possible to obtain Carbon 14 dates from the cremated remains to pinpoint this date more accurately.